It comes in a nice, solid box with a openable cover and underneath the cover you find a view window, where you can see the card, but to take it out, you must open the box from side. This window is very good if you go into a shop and want to see the actual product, without opening the box. It's extremely easy to open the box, just a small sticker and then side opens up and out slides the plastic that holds the GTX680 itself. It takes up 2.5 slots due the better and bigger heatsink. There is another GTX680 i like by Asus with DirectCU II heatsink, which takes up 3 slots, but Phantom looks just a lot better. 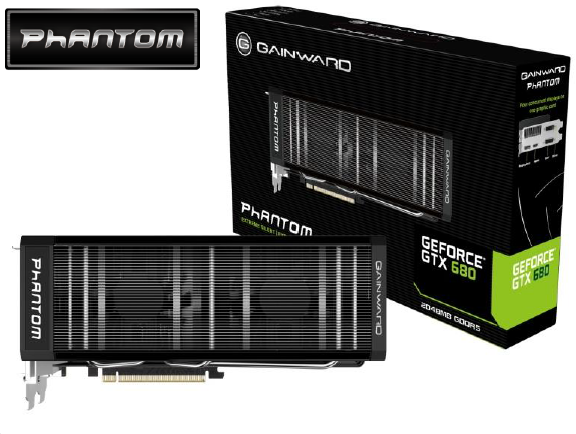 Unlike the default GTX680, Phantom edition comes with 8-pin + 6-pin power connectors. GTX680 originally had 2x 6-pin connectors, but this was changed by Gainward. Asus DirectCU II version also has 8+6 pin connectors. It supports 4 monitors at same time, so you can have a super wide screen over 4 monitors. You will find DVI x2 ports, 1x HDMI port and 1x DisplayPort. As you can see, Phantom is better in every way, this is possible due the Phantom's heatsink / cooler that does a good job. Phantom is simply better in every way than normal GTX680, however Asus DirectCU II version has little bit higher Clockspeeds than Phantom, because it has even bigger heatsink. Many say that "there is no performance difference, just go with cheapest one", but as you can see, a bigger heatsink allows higher base clock speeds, you do not need to overclock this card, it works out of the box on higher default speeds than normal / original GTX680. Worst choice would be to get graphics card with only 1 fan on it, because they are extremely noisy and lot hotter. I've had it for about a week by now and it literally beats the games, meaning that game engine is not meant to give higher FPS than this card can handle. For example Need for Speed SHIFT 2 Unleashed is one of them, where framerate simply won't go over 40-70fps with absolute ultra graphics, another game is GTA IV where framerate is similar, from 40 - 70fps, depending on the areas. However Crysis 3 is a real challenge even for this card, i tested Crysis 3 on absolute max @ 1920x1080 and i got 25-40fps, depending on the area, but if i turn Multisampling and Anti-Aliasing down or off, then i get instant 100+ fps, so this Beast graphics card is enough to play even the most demanding games. I have to honestly say that i did not notice any difference if Anti-Aliasing is like 16x or 2x, at least not on 27'' IPS monitor. Anti-Aliasing and Multisampling should look very nice on super high resolution monitors, like those Samsung PLS monitors, that have higher than 1920x1080 resolution, however even this Beast graphics card is not enough to run games on absolute max above 1920x1080, it can easily run games, but struggles with Anti-Aliasing and Multisampling, however Far Cry 3 on absolute max (including anti-aliasing and multsampling) still runs on a good 70fps. Temperatures are from 32 - 66C. I have extremely good PC Case (Antec DF-85 full tower) to help cool it and i have also set custom fan speeds with MSI Afterburner, so fan speeds are higher on lower temps, keeping the card under 70C, which is actually very good for Graphics Card, considering that some of them go over 90C! Considering that Phantom has higher clocks than original 680, it may even be better than nVidia's listed 770 on their website, in fact Phantom has higher clock speeds than 770 on nVidia's website. 590 comes really close too, but 590 is out of date and i do not recommend it, even tho you may find one for quite cheap nowdays, 590 is the most power hungry graphics card in nVidia's list with 365 watts of power draw under load, while GTX680 is only 190 watts under max load, however Phantom edition probably takes bit more, maybe 200-210 watts of power under load, still way under 590. GTX770 takes 230 watts of power, based on nVidia's website.